First trip to Lapland. All you need to know. 13 Dec First trip to Lapland. All you need to know. Lapland, the home of Santa Claus and Rudolph, is one of the once in a lifetime destinations. For us, as Greeks, who are not accustomed to such landscapes, a trip to the Arctic Circle is magical, especially in winter. We can say with confidence from our personal experience that it is a destination worth saving money for. In this post you will find all you need to know to organize your first trip to Lapland (hopefully!). So, let’s answer some questions! Lapland geographically is in the Arctic Circle, which means that it is near the North Pole! As you understand this part of the world is just a little different from what you are used to. Especially for a Mediterranean! In Lapland there are seasons, summer and winter. In the summer (June to August) you will enjoy the so-called “white nights”, as the sun does not go down completely during night, and the temperature is around 12-15 degrees Celsius. In winter, or in the snow season (November to March), the polar nights begin, where there iare just a few hours of day light. It looks sunset time from 10.00-16.00. The temperature is around -15 but it can go even lower. How to choose when is the best time to make your first trip To Lapland. It depends on what you want to see! The high season is in winter; as most people, like us want to experience the snow season. Also, in Lapland you can find the village of Santa, many travelers choose this destination for Christmas. So let’s see what you can enjoy in each case. Winter: Snow, husky or reindeer rides, northern lights, snowmobile. Summer: sunny days, unparalleled nature, hiking, kayak. Beware of the transition months, such as September, October and May. For example, if you want to see snow, October even if is winter there is a strong chance that there will not be any snow. However, you may see the northern lights! The coldest months with the most snowfall are January and February. We made our first trip to Lapland in late November. Is Lapland an expensive destination? Well, yes. All Scandinavian countries are a bit expensive, so Finland, where Lapland is located, is no exception. Also, due to the “Santa Claus story” villages like Rovaniemi , which is more touristic, can be even more expensive. So…how expensive?! In winter, the most affordable, wooden-style lodge from Airbnb starts at 100 euros per night. If you choose to stay in a glass igloo, or an aurora cabin the prices are about 350-500 euros per night. During summer, prices fall. Winter activities such as the Hasky ride cost an average of 100 euros per person for one hour, while snowmobile tours go up further. Dining in a restaurant is also a significant cost. 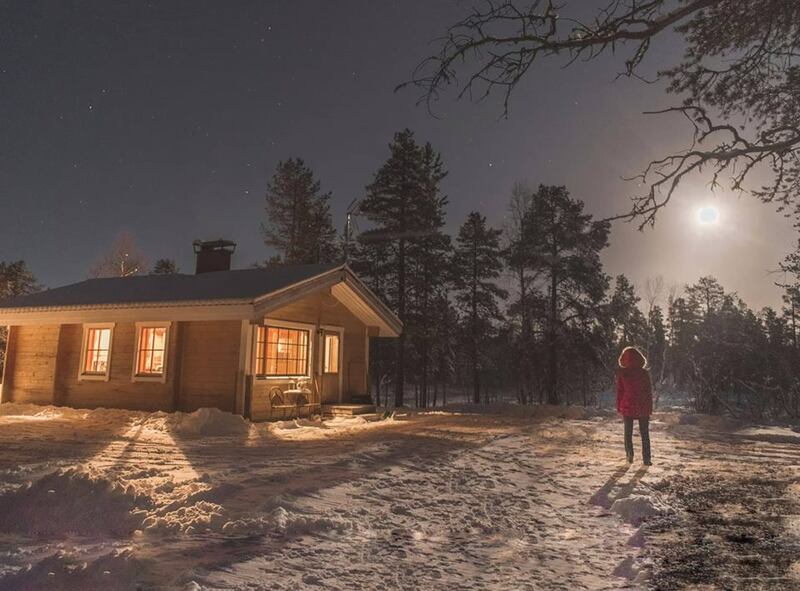 If you want to make your first trip to Lapland on a budget, we would suggest that you set priorities. You can stay in a wooden cabin most of your days (€ 100 per night), shop at ta supermarket and cook most of your meals there. This will make it easier to invest in activities and stay one or two nights in an aurora cabin. How to get there and what transportation mean to use? There are several airports in Lapland. The most popular airports are Rovaniemi, Ivalo and Kittila. Most flights are connected via Helsinki and last for 1-2 hours. The airlines that serve these routes are Finnair and Norwegian. Geographically the lowest village in the Arctic Circle is Rovaniemi, then Kittila and finally Ivalo, where we stayed. This is particularly important in the transitional months where snow may have started north but not everywhere. The best way to move around during your first trip to Lapland is by car. The cost is 80-100 euros per day from a well-known company, and you do not have to worry about the snow as all the cars have special tires. Private transfer via hotel is quite expensive, while buses are not so frequent. However, these are also options! When to go in order to watch the northern lights? For most of us, a trip to Lapland is not complete unless we see the northern lights. The truth is that the Northern Lights are impressive but let us tell you that Lapland will satisfy you even if you do not manage to see it. The months that you can see it is from late September to April. A basic requirement is to have a clear sky. It may appear at any time after dark, but most likely between 22.00-01.00. The moon does not play a role even if it quite bright. Our photo is a live example! Do not worry because it’s a matter of luck! According to the locals every 3 days (on average) the Northern Lights appear. It can last from a few minutes to all night. To be able to take a photo you will need special settings on your camera. The smartphone may not catch it, or the result will be incomplete. Now you are ready for your first trip to Lapland! See more about our trip to Lapland on Instagram (highlights stories #Lapland).